Congratulations to Clay Aiken. He rated the number 1 position on the mainstream AC charts at Promosquad’s HitPredictors. The results that were just recently published show that Clay was in the top position for the months of November, December and January. According to the HitPredictor site, the chart is a gauge of an artist’s popularity, above and beyond the song charts. Every aspect of the artist’s career is a part of the score. Chart performance is impacted by many different things, including marketing, airplay, TV appearances, the Internet and even rumors. HitPredictor started its Internet based pre-testing in 2003 by turning to real music fans for their opinions. A list of several hundred artists is compiled and the artists are rated by carefully screened music fans. Songs are blind tested online by Promosquad using multiple listens and a nationwide sample of music consumers. Songs are rated on a scale of 1-5; final results are based on weighted positives. So, in spite of the lack of radio support for Clay Aiken, he still is at the top of the charts. Just think about the hits he would have if he had some support from the record executives who are supposed to be in his corner. For more information on Promosquad/HitPredictors, check out their site. Thanks for the information. Your last sentence rings very very true – what would of happened to Clays career if he had been supported the way he should of been – its gonna be one of the unanswered questions…..
I’m so glad that Clay is number One – he deserves to shine and he always will in my heart. Clay Aiken is an all around EXTREMELY TALENTED man with an AWESOME, DISTINCTIVE, POLISHED SET OF PIPES. THIS MAN CAN SING!!!! He was WONDERFUL in his roles in “Spamalot” and he truly deserves all the accolades he may receive. I so do wish there were more “singers” out there with this man’s style. You go Clay, Keep on entertaining and making so many fans proud and happy………….. I don’t know how the executives at RCA can call themselves businessmen. They missed the mark horribly in their promotion, or lack thereof, of Clay, and that translates into probably millions of dollars of lost revenue for them as well. Well, Clay is #1 in my book!! Pretty impressive that he has remained at #1 on this chart in spite of no airplay. Just imagine how that album would have sold if people knew about it and heard those amazing songs. Yay, I am here again at last. ( Yes, I had been here once before) I voted in the poll (better late than never)Loved seeing all those TV Guide covers again. Thanks for posting the link (as asked) I too am amazed that Clay has stayed on the HitPredictor chart. I am glad to read that Clay is #1. He has always been in my heart and will continue to be. If RCA had promoted him as they should who knows what would have happened? I will always do my best to support him-his voice is such a gift. Clay Aiken’s music is the best kept secret in the USA thanks to his label. I just am thankful that I keep up with him and have all of his albums to listen to everyday. What a voice. 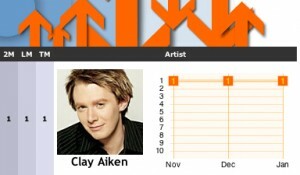 Awesome news about Clay Aiken’s position with Hit Predictor! As Outback wrote, Clay’s music is the best kept secret in the USA. Hopefully, that will change as others become aware of his magnificent voice, entertainment skills, and humanitarian work! Thanks for the information. It is amazing that with all the interest he cn generate, his label still didn’t lift a finger to promote him. Makes you wonder where they went to business school. I am so glad to see Clay at #1 on the Hit Predictor. That says something about how talented he really is. What a shame that his own record company does not support him. He deserves better…but, the best is yet to come. Thank you for letting us know about this! #1, all right! He so deserves it, and more… but never mind, he’s still gonna get there, just more slowly, and this way he’s been able to do Spamalot, be with Parker, and finally get a bit of a rest, whew!! I agree, the best is yet to come!! I am scratching my head at this one! Let’s hope something good is just around the bend for Clay music wise! He is so mad talented and it’s about time his talent is recognized! It is amazing…Not that he is #1…but the point that his label doesn’t support him in the least…. I love Clay’s voice…he is wonderful, and his day will come…of that I am sure…. Error: Error validating access token: Session has expired on Tuesday, 21-Aug-18 16:13:01 PDT. The current time is Monday, 22-Apr-19 23:50:50 PDT.